Special feature: The meat content of TB-Hirschwurzn consists exclusively of lean muscle meat! That's why: wonderful, cartilage- and tendon-free mountain sausage enjoyment with a fine wilderness note, simply delicious. ready for shipment: in ca. 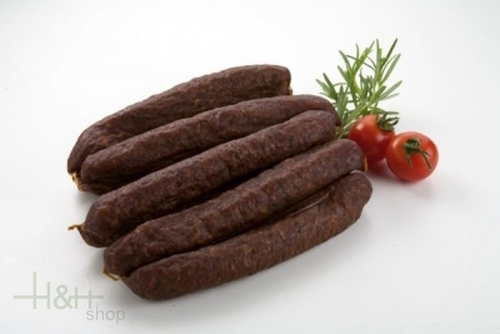 5 days Smoked Sausages Kaminwurzen Villgrater 3 pieces-app. 230 gr. South Tyrolean garlic sausage Villgrater approx. 220 gr. 6,15 EUR / 2,80 €/100 gr. Mortandela smoked salami without peel appr. 250 gr. - Kofler Speck 5,90 EUR / 2,36 €/100 gr. Land hunter Villgrater approx. 180 gr. 5,90 EUR / 3,28 €/100 gr.